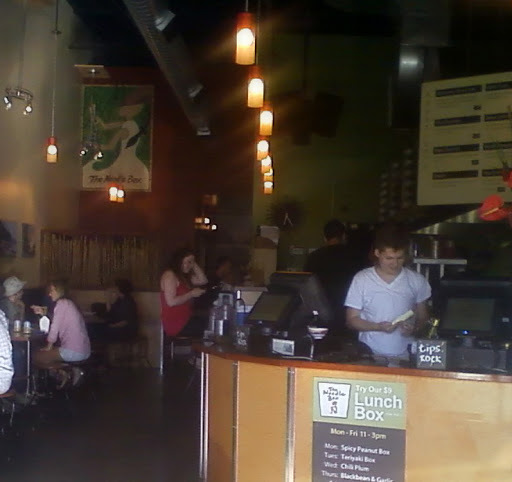 I never liked the atmosphere at the Noodle Box’s Douglas St. location. The music was loud and it has the feel of a dungeon. Every time I walked in, I could never shake that feeling away. The strip of walkway where orders are picked up and where some people use to stand-and-wait was tight. That’s the only spot where one can hear that their order is ready. But just to hear one’s name being shouted out requires the ears of an elephant. Eventually, I just stopped going there and when friends wanted to hit the Langford location–as we were on the way to a meeting–a quick bite was needed by all of us. This other location was far more comfortable, The music was not as loud and the feeling of being confined gone. Trying to hear when orders were ready to grab was still a bit hard, but that’s only because the kitchen noise is as loud as ever. That’s something I now know as part of the Noodle Box experience. And this place certainly does a better job at making the food look as delectable as it sounds. What I opened had colour to it. The cooks here care more about making the experience pleasurable in different levels than to quickly churn out a product. I had the Kung Pao with Prawns ($15.75 after taxes with a can of pop) and asked for a mild kick to my meal. The Hokkein noodles certainly were better tasting than in what the Douglas St. operation did, and they gave pieces of lime that didn’t resembles sour grapes. The greens and cashews both had a good warm crunch to it, and this was one meal I was studying all the way to the bottom. Yes, Virginia, nothing got layered. That’s often been a problem with any take-out. Given the amount of space that’s available in the box, any noodle combination that’s wok fried can hit the container in layers. Although the next time I do general noodle box comparisons, I’ll have to take a ruler with me just to measure its’ dimensions so I can calculate the volume of air they can hold. Either my imagination is deceiving me, or this franchise operation uses the most stunted boxes available. I could swear that the containers used at Salt Spring Noodle Bar were taller. But when considering that it’s not possible here to fill a box to the top and leave it open, well, the lesser known the operation is, the better. That’s only because hungry hippos only want more. This entry was posted in Food, Reviews and tagged Asian, Franchise Operations, Fusion, Langford. Bookmark the permalink.